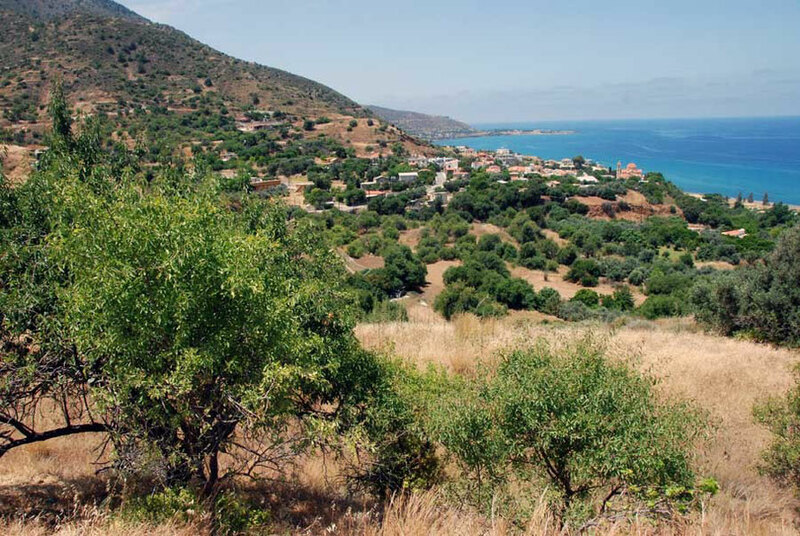 I followed the road up behind the Kokkina enclave, which rejoins the coast and continues onto Katos Pyrgos before running into the Green Line with the new crossing at Limnitis. I turned around before this as time was pressing. 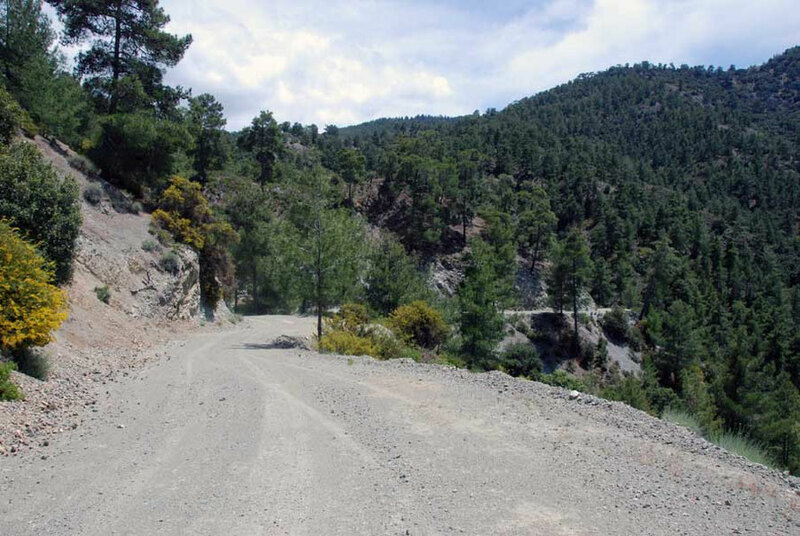 I could have taken the 'main road' - the F740 - into the mountains but I had seen a dirt road heading up from Pomos on the map that looked more interesting. So I back-tracked to the turning, bid adieu to the sea, and set out on the road - signed for the 'Livadi Picnic Area'. The tarmac very soon runs out and a single track dirt road skirts along the edge of the valley. I encountered a lorry and a van early in my journey and then for the next hour and a half I saw no-one. Not a single car. Not a human being. 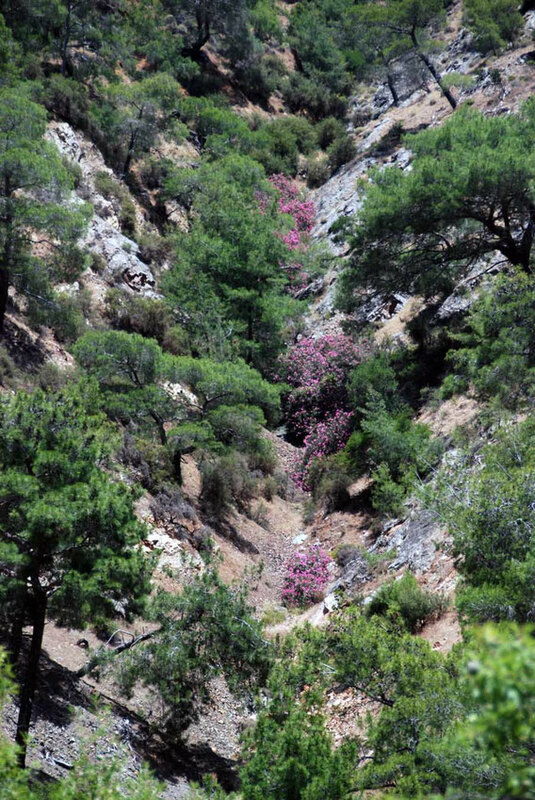 I drove along the road, keeping clear of the fallen rock on the cuttings. I was quickly into the vast stands of brutia pines that dominate the Troodos. The road was well graded and I thought to myself that if it kept on like this I'd have no problem reaching Stavros tis Psokas, 48 km distant. On the other hand, I was well aware that the road would have to climb hard to get up to 1000m above sea level and that there might come a point where the Fiesta was not up to the job. 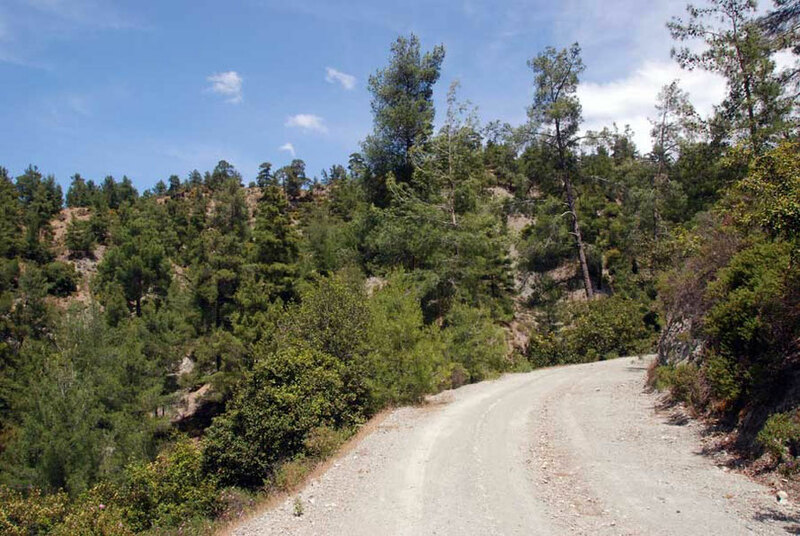 My greatest fear was getting stuck miles up the road on a particularly nasty bit of track, particularly where it cuts round bluffs and the underlying rock and rockfalls are worst. I also knew that the worst thing with rough tracks is to panic and rush them. That's when trouble happens. I got myself in second gear, kept a weather eye on the temperature gauge, and munched on breadsticks, getting sesame seeds all over the place. Whilst having these thoughts and reassuring myself a lizard darted from the surface of the road. It ran with its legs in a crazy paddling motion and stopped on the bank above the road and allowed me to take three photos of it. It's a Sling-Tailed Agama and I was to see plenty more of them on my descent from Kampos later. Apparently they can change colour to express their mood. Maybe that pinkish blush is anger or embarrassment at being caught knapping on the road. 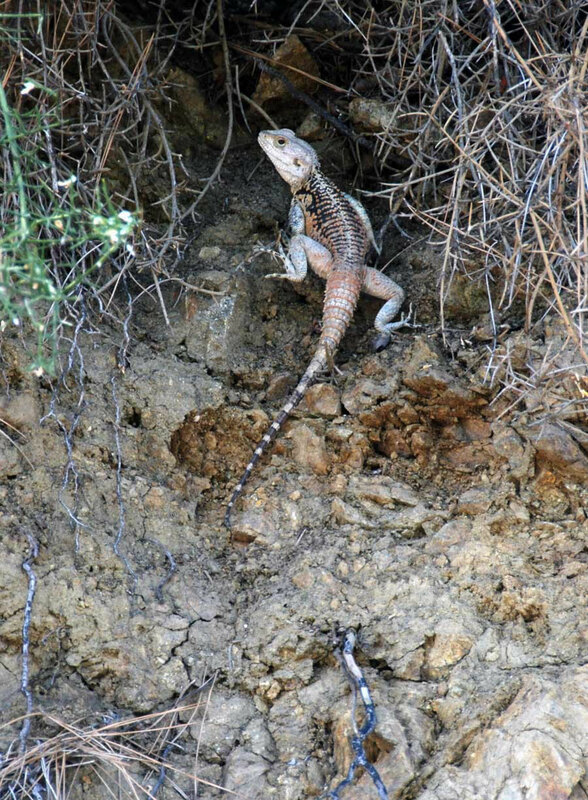 The Sling-tailed Agama in Cyprus is an endemic sub-species Laudakia stellio cypriaca and common on the island. I thought he was a splendid beast. After 7km of slow going I came to a small church. I thought maybe I had already reached the Livadi Picnic spot but I was only half way there. 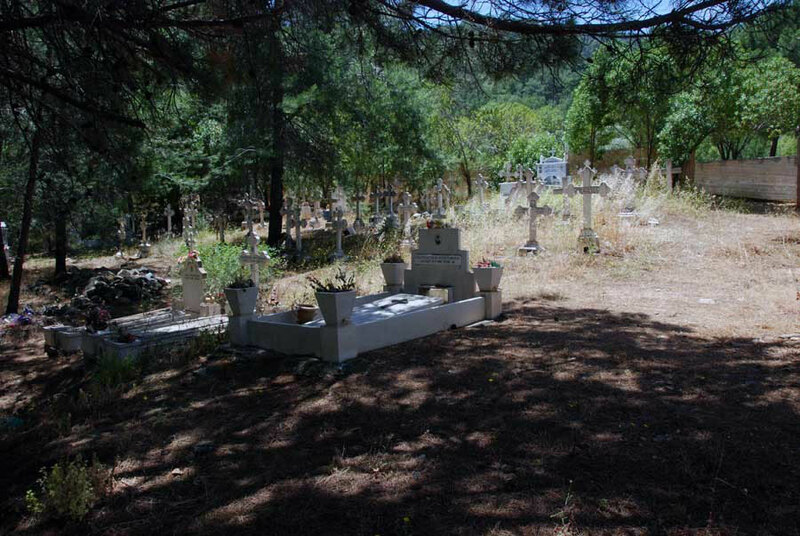 The church was careworn and there was rubbish in the graveyard. Inside it was blessedly cool while outside the calm sigh of the breeze in pines was homely. The road continued climbing and fallen rocks made the going slow. 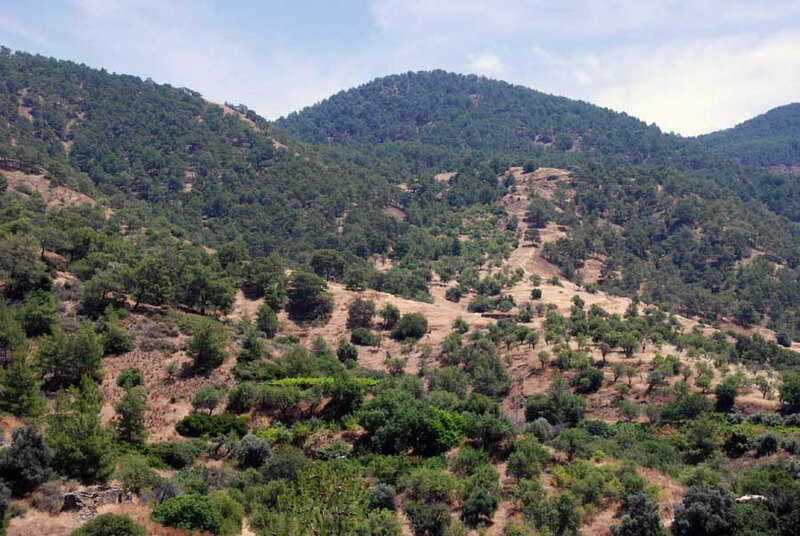 I passed the deserted Livadi Picnic Site in due course, shaded by huge plane trees and pushed on into wilder country. Every now and then a track would fork off to the left or right, usually with a reassuring No Entry sign but the recent tracks on the road had thinned out since the picnic site. I was pleased to note that the tracks did not look like wide pick-up tyres and hoped that all would be well for the 18km to the top. One part of the route took me deep under larger trees where water trickled out from the steep rock walls and across the road. These areas were muddy and gave me pause for thought. In the deep shade I couldn't see the depth of the puddles and the extent of the mud. I stopped and got out of the car and prodded an exploratory foot into the mud and water. I gave the car a bit of gas and rushed it through hoping I wasn't going to wetter ground and get stuck. The dirt road way above Livadi in the howling wilderness of the Tilliria. Funnily enough, despite being in the middle of what Marc Dubin calls the 'howling wilderness' of the Tilliria I knew exactly where I was. In a manner of speaking. There was only one road shown on the tourist map from the kiosk in the baggage reclaim area of Larnaca airport and I was on it. It's just that there was nothing very near that road save for steep valley upon steep valley of Brutia pine and yellow-flowered broom. 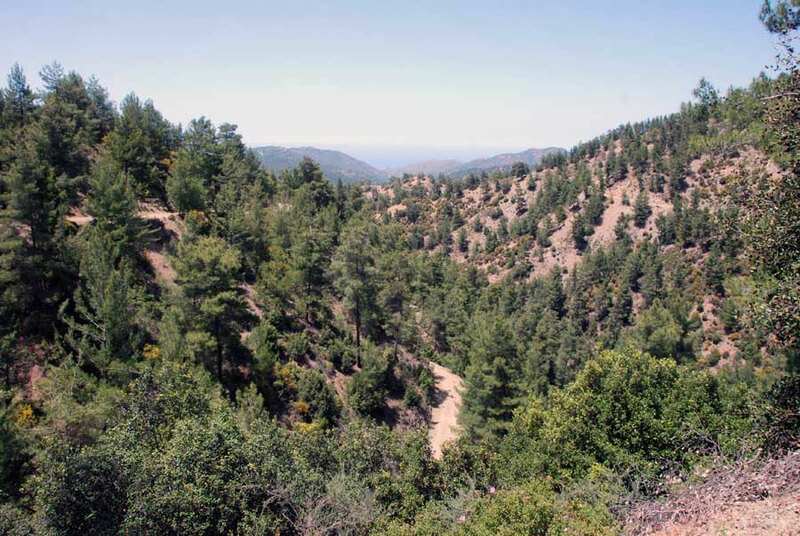 The deeper, darker parts of the drive now gave way to more light as I neared the top of the spur of the Troodos which I had been painfully driving up. I thought to myself that it could not be much further to a tarmaced road as there simply couldn't be much more 'up' to do. But I was wrong. 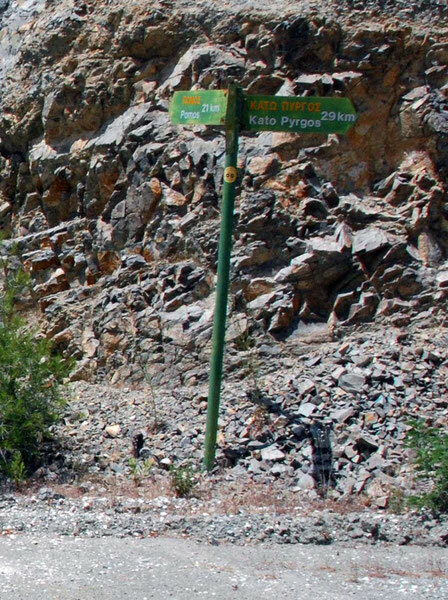 After four more kilometres I came to a 'Caution 'sign and after another 200 metres I came to a 'Stop' sign and the metalled road to Stavros. I parked up and took celebratory pictures. Again, the slience was palpable and heightened by the wind in the pine needles. There was no sound of human activity. The sun shone hard but the air was cooler. I had climbed 1000m from the sea at Pomos.